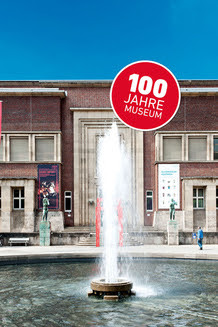 The Museum Kunstpalast, often referred to as 'the treasure house of the city', celebrates its 100th year this week. On Saturday July 6 a full programme is planned including free tours and a festival in the Ehrenhof. Bands will be playing from 3pm until 11pm including musicians from the Clara Schumann Music School and the Robert Schumann Music School and the Japanese drummers Shin Daiko. There will also be a children's workshop. To mark the centenary a book has been produced by the museum and the Rheinsche Post, 40 Düsseldorfers were asked to choose a piece of art work from the collection and write a personal story about this. I was absolutely delighted to be invited to write too (and hugely nervous!). The book was presented at a reception at the museum on Tuesday July 2, one day after the actual birthday. I chose to write about Marta Klonowska's Glass Goat, a delightful sculpture from the Hentrich Glass Collection, one of my absolute favourite spots in the city. The book is in German only and available in the gift store at the musuem and at bookshops in the city and includes contributions by cult director and Düsseldorfer Wim Wenders, City Mayor Dirk Elbers and video museum owner Julia Stoschek. I'll have to check if I may add my piece, originally written in English and translated by the museum, here for you to read in English ... and here it is!